Hydronic heating, very simply, is the use of hot water (hydro) for heating a space. For many years large buildings have used hydronic heating in conjunction with boilers for heating (remember the old radiators?). In the North many residential homes are heated with residential sized boilers due to the long heating season and the higher efficiency of hydronic heating. Here in Central Texas we employ a similar system but on a smaller scale as our heating season is not as long. However, building and homeowners can still see a great benefit due to the higher efficiencies of hydronic heat. I don’t have a boiler; where does the hot water come from? Due to the relatively short heating season in Central Texas we do not need to incur the higher up-front cost of boilers; we can get away with using a slightly oversized water heater. Your heating water comes from your water heater; either a tankless or a traditional tanked version. Given the high efficiencies of today’s water heaters we can see great efficiency benefits while keeping our upfront costs lower. Yes and no. Today’s hydronic heating coils are manufactured to be compatible with a wide range of equipment including Carrier, Trane, Rheem and most others. There are also manufacturers who specialize in hydronic heating equipment, not just coils, like FirstCo, Water Furnace and others. To make hydronic heating work all you really need, in addition to regular A/C equipment, is a heating coil designed for hot water heating and a small pump to move the water from the water heater, through the coil, and back to the water heater. What are some other design considerations I should be aware of? Like any water piping in the home or building considerations should be given for the location of the equipment to protect the water from freezing. These considerations may include things like equipment location, insulation, low temp stats to circulate water or even special heaters to keep the piping warm during times of extremely low temperatures. Are there any special maintenance related concerns? All heating and cooling equipment needs to be serviced at least twice a year. We will perform routine maintenance on the hydronic heating system along with other required routine maintenance. No special maintenance work is required on hydronic heating versus traditional heating. The single biggest thing as a homeowner you can do is to keep the filter changed on a regular basis. Fig. 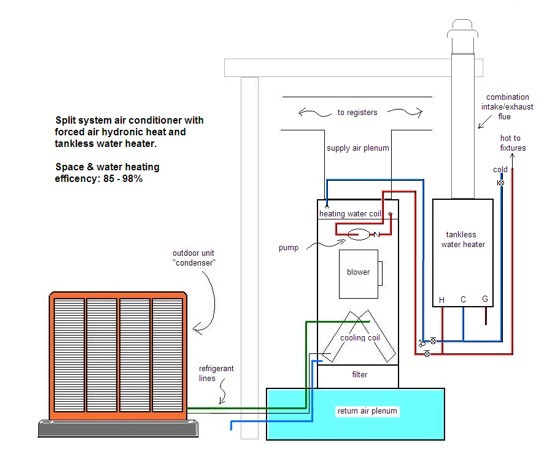 1 above shows a typical up-flow heating/cooling system utilizing an hydronic heating coil. This one uses a tankless water heater but a traditional tanked water heater can be used as well. Additionally, the equipment can be in either the up-flow position (like you see above) or the horizontal position; like in an attic or crawlspace.